Recently, I invested in some intolerance tests to investigate if my diet, environment, or vitamin/mineral deficiencies may be contributing to my health issues. I wanted to be armed with the knowledge of how to best care for myself, hoping to regain strength and energy, both of which I desperately need these days. The results came back in five days, but it might as well have been a lifetime. I was eager to see the results. I had high hopes the key to the “new me” could be found in avoiding a few things giving me grief. I knew the testing was extensive, but I had no idea the list of things to which I’m intolerant would be SO LONG! The tests are broken down into four categories: food, environment, deficiencies, and metal toxicity. The food category is organized according to levels and colors corresponding to a traffic light. Level 3 is red and means stop eating these foods as there is a severe intolerance. Level 2 is yellow, indicating the participant should slow down their intake of these foods as there is a decent level of intolerance. Level 1 is green, meaning proceed with caution. These items show a slight intolerance level and should be evaluated at a later time, after addressing the foods on Levels 2 and 3. I cannot describe my horror as I scrolled down the list of Level 3 (RED) foods and saw the word, “cocoa.” As in chocolate! I’m pretty sure the blood running through my veins is nearly 50% chocolate. I love the stuff! I eat it all the time and have for as long as I can remember. Everyone who knows me knows chocolate is my favorite of all favorites. And now, it must be banned from my diet. Kill me now!!! As I shared the results of the tests with Jason, he looked at me sympathetically and whispered, “You wanted to know.” He’s right I did. At least, I thought I did, but now that I know, I’m not so sure I want to. After all, if I didn’t, I could continue to enjoy my chocolate in ignorance. But now that I know, I have a duty to do something with that knowledge. And I can’t say I’m particularly happy about it! I wonder, though, if that’s why God often keeps things hidden from us. It’s not that He's sneaky or cruel. I think He does it because He knows we can’t handle the truth. . .at least, not yet. We think we want to know. We believe we want to see around the bend. But do we really? What if there’s heartache? Disease? A miscarriage? Bankruptcy? Or, heaven forbid, an intolerance to your all-time-favorite food? What would we do with such knowledge? How would we handle it? My guess is, not well! And God knows that. They say, “Ignorance is bliss,” and in some cases, I can see where that could be true. Sometimes, it really is best not to know. As for my intolerance to chocolate (and a long list of other foods), even though I’m not happy with the results, it’s good for me to know because now I am armed with the knowledge to do something for my health. After all, if the intolerances are as severe as they seem, I’ve been poisoning myself for a long time without even realizing it. So, in this area, ignorance would not be blissful. It would be deadly. God knows best, dear friends. He will tell us what we need to know when we need to know it. And if there’s some area in which you feel He’s keeping you in the dark, please know that He has a good reason for doing so. Maybe you really don’t want to know. Remember, He has your best interest at heart. Trust Him. Sometimes it’s better in the dark. As I studied for my Sunday School lesson, I felt both excited and sad. Excited that my ladies’ Sunday School class was finally going to complete our Wilderness Wanderings series and reach the Promised Land. Sad that it was the last class for me with my ladies because Jason and I will be hitting the deputation trail, which means we’ll be in and out of a lot of different churches over the next several months. I know some may view giving up a class as a blessing or a reprieve, but words cannot describe how much I love teaching God’s Word. I get excited about Sunday School, and I will miss being there each week with my precious ladies. Okay, moving on before I get all blubbery. . . again. One of the main things I love about teaching is the learning process I have to go through first. When I dig into God’s Word to prepare my lessons, He never fails to open my eyes to such beautiful truths, and usually, the lesson is something I need to hear. This past week’s teaching was no different. As I studied to cram about four weeks worth of lessons into one so we could get out of the wilderness, I came across a verse that was exactly what my heart needed to take in. As the children of Israel prepared to cross the Jordan River, Joshua gave them the orders the Lord had given him. The priests, carrying the ark before the people, would make their way down to the river, step into the raging waters, and stand there while all the people crossed. Miraculously, when the priests stood still in the river, God caused the flow of the water to cease WAY upstream and gather in a heap. Meanwhile, the rest of the water either flowed away or simply vanished because the Bible says the people walked across on dry ground, just as they had done with the Red Sea. God didn’t want the people rushing ahead because they thought they knew what to expect. After all, their parents had told them how God parted the Red Sea, so in their reasoning, God would do the same thing the same way here. But He didn’t. He had another plan, a different way. And He wanted them to understand how much they needed to wait. Stand back and watch. Watch for direction. Wait for guidance. Don’t just jump ahead thinking you know what to do and how to do it because this is all new territory. Oh, how that blessed my heart this week. I don’t know about you, but right now, Jason and I are covering new ground. We haven’t passed this way before. We’ve spoken with other missionaries who have, and of course, everyone has their ideas and opinion on what works best and how it’s supposed to be done. And that’s fine. In fact, we have our own thoughts about how we want to work on this new path. But God graciously reminded me to be careful that we don’t rush ahead thinking we have it all figured out. Advice and opinions from those who have come before us are great. The Bible has much to say about good counsel. But, in the end, we need to wait on God and follow His guidance. We need to step far enough back from our own ideas that we can see what God has for us. This is new territory to us, but it’s not to God. My friend, whatever you’re facing today, I encourage you to step far enough back from the problem, the situation, and your plans that you can see what God wants you to do. Wait for His guidance. Don’t rush ahead of Him thinking you have it all worked out. That always leads to trouble. 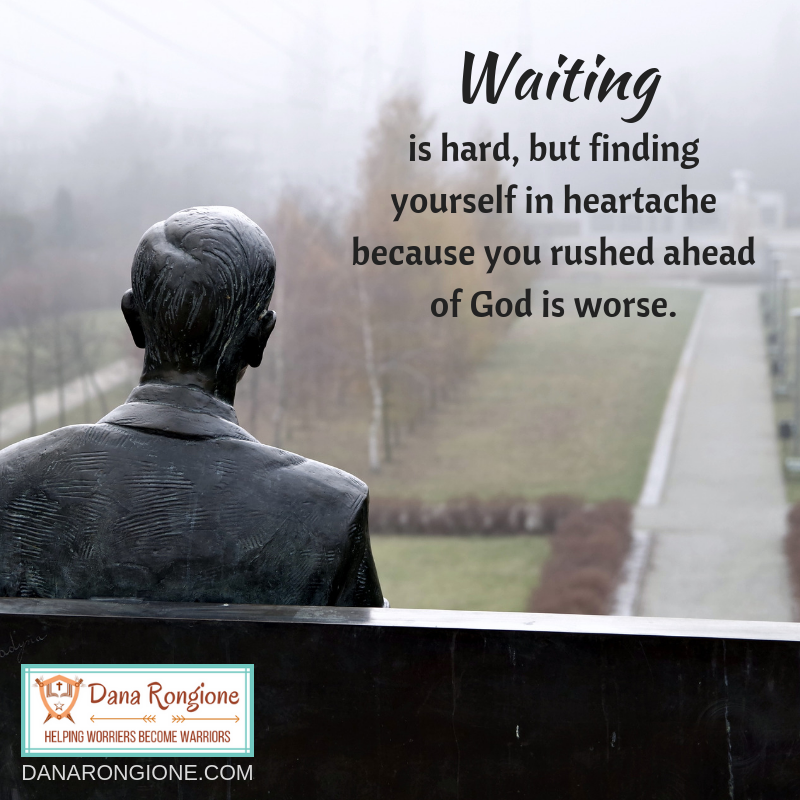 Waiting is hard, but finding yourself in heartache because you rushed ahead of God is worse. Put some space between you and your issue and close the gap between you and God. Life will be better that way, and you’ll reach your destination, just as the children of Israel did. Psalm 40 is a beautiful, heartfelt passage. It begins with praise and transitions into David pleading for God’s help for himself and judgment on his enemies. So sincere. So human. And, I admit, it’s the latter statement that literally makes me chuckle when I read through the chapter. Why? Because I see myself in David’s writing. Notice in verse one, David says, “I waited patiently for the Lord.” He begins the chapter in peace, calming waiting on the Lord to work. From the rest of the chapter, we know things are a mess in David’s life, and he has every reason to be frantic and worried. Yet, verse one finds him worshiping God and quietly waiting for God to intercede on his behalf. But notice what happens. I’m so glad God didn’t use perfect people to write the Bible. I’m so happy He allows us to see the faults and fears. For me, it’s comforting to know I’m not the only one who often starts my day patiently waiting on the Lord, confident in His plan, only to find myself a few hours later crying out, “Okay, Lord, enough waiting. It’s time for action, right?” It’s cheering to know that the man God declared to be a man after his own heart had spiritual and emotional mood swings which transported him from the mountaintop to the valley in less time than it takes to say, “Chocolate cake, please.” And the reason I find comfort in this is because God was still able to use David to accomplish mighty things. Despite the psalmist’s setbacks and mood swings, God worked through him, and that gives me hope. I was scrolling through Pinterest the other day, and I came upon a pin picturing a minion sitting in a cross-legged pose muttering, “Come on, inner peace, I don’t have all day.” I laughed. That’s so me! I have the desire for inner peace but seldom do I have the patience to sit still long enough to allow my mind to find that peace. Likewise, I want to wait on the Lord, to allow Him to have His perfect way in my life, but when problems arise, I want instant solutions. But here’s what I’ve learned from David’s life. Though his life was never easy, God always had his back. God protected, guided, and blessed the shepherd-boy-turned-king. David faced hard times (usually as consequences for his sin), but through it all, God was faithful and came through at the right time. I can trust God will do the same for me. . .and for you. No need to panic!